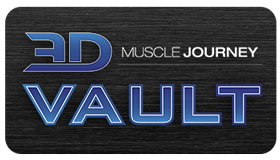 This week we are joined by coaches Andrea Valdez and Alberto Nunez for the third installment of the 3D Muscle Journey “Origins” series. The two start by discussing Alberto’s early life and how his early experiences of communicating with a wide variety of people were one of the major influences in shaping him into the world class coach he is today. Alberto’s early life wasn’t the easiest. He was surrounded by peers who took to the likes of fighting, stealing and other gang related behaviors. By the time he graduated high school Alberto had attended 11 different schools. Alberto explains how the introduction to weight training by a close friend was probably the main reason he didn’t find himself following a similar path. Andrea and Alberto discuss what sport temporarily lead him away from bodybuilding, Alberto’s first prep, and his take on the early beginnings of 3D Muscle Journey. The two conclude their conversation by addressing some very interesting questions: Was there ever a time bodybuilding had a negative impact on Alberto’s life? Now that both he and 3D Muscle Journey have a reputation, does he feel increased pressure when prepping himself or other athletes? What are his future bodybuilding plans?, and many more.